When I became a mom the first thing I noticed was I stopped buying things for myself and started spending all my money on my baby. I also started reading labels much closer and paying attention to what chemicals were in the products I used. I think many new moms do the same. We become focused on trying to provide the very best for our children. Ecocentric Mom is a monthly subscription box catered to mommies! Ecocentric Mom realizes moms need a little pampering too and that many of us want eco friendly products so they put together a monthly subscription box for us. There are several stages in motherhood so Ecocentric Mom created several different boxes to correspond with those stages. There are three different boxes to choose from – Pregnancy Box, Mom and Baby Box and Mom Box. 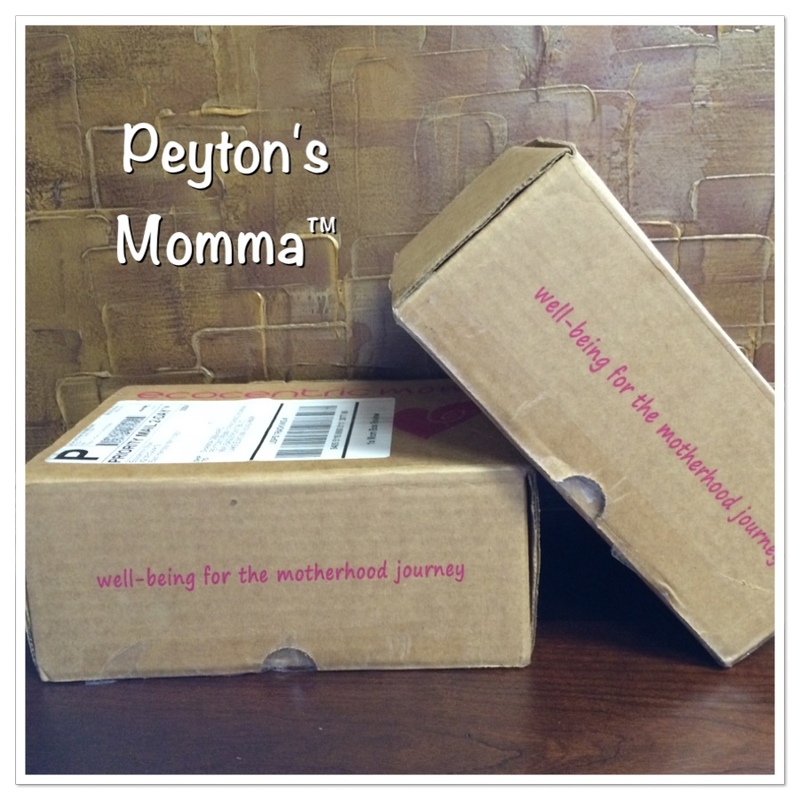 Each box is curated with products for the stage of motherhood you are in. We received the Mom and Baby Box and Mom Box to try out. And they were pretty amazing! Bendies – A bendable spoon and fork set for babies! I really love the little yellow ducky. It’s an adorable theme suitable for a little girl or boy. You can pick up your own set of Bendies at Piyopiyo. Enter WIPES10 at checkout to receive 10% off your order. ellovi Butter in Mint Chocolate – It smells divine! Reminds me of a Peppermint York Patty or mint chocolate ice cream. Either way it makes me hungry! But it works wonders on my dry lips. ellovi only uses 6 ingredients in their butters and water is not one of them so you have a rich, thick, creamy butter to slather on those dry spots. Available for purchase online. Enter promo code Ecocentricmom at checkout to receive 15% off your order. Acure Baby Fix It – Another wonderful health care item. This is perfect for when your baby gets a little scratch or whatnot. Just take the stick and apply a little to the scratch. You can also use it on your baby’s lips and nose and even on your stretch marks! Available online at Acure Organics. Enter promo code EcoMomACURE20 for 20% off your order. Piyopiyo Pure Water Baby Wipes – A baby wipe made with water. Free of chlorine, parabens, SLES and dyes. Available at Piyopiyo. Enter WIPES10 at checkout to receive 10% off your order. Love Child Organics baby food – Perfect for 6+ months. We received the beets, sweet potatoes, apples + cinnamon variety. My daughter just loved it! I liked how easy it was to serve it and that there was no mess. Available for purchase online at Love Child Organics. Enter promo code LCOECENTRICMOM15 at checkout for discount. Enjoy Life – Grab and Go Seeds and Fruit Mix. This is wonderful for keeping in the diaper bag or purse for an on the go snack. I like to keep it in my purse for when I find myself stuck somewhere without a snack. Available for purchase at Enjoy Life Foods. LOQI – a shopping bag that folds up into a little pouch taking up virtually no room when not in use. This is perfect to toss in the diaper bag or purse when out and about. Too many times I have been out and realized I have way too much to carry. This little bag will come in handy for us. Available for purchase online at LOQI. Enter promo code LOQI-Beauty-2015 for 20% off your order. Frontier Bites – Macadamia Pineapple Coconut Bite. Another perfect travel size snack to take on the go. They were crunchy and sweet! Definitely a product I will be buying to keep in our pantry. Available for purchase online at Frontier Bites. Enter promo code ECOCENTRIC for 25% off your total order. Essence of Vali – This is a sleep soothing mist. Sometimes we have a struggle at getting to sleep. But if you spray the Essence of Vali on your pillow or sheets it’ll help you relax and drift off to sleep. Wonderful for when you are traveling and staying someone that’s not home. Available online for purchase at Essence of Vali. Enter promo code ECOMOM for 20% off your purchase. EiR NY+C – This is a 3 in one product! It can be used as an hand sanitizer, body deodorant or odor eliminator. If you are out and about and have no place to wash your hands simply spray your hands with the EiR. Car smelling a little funky? Spray it with the Eir. Just get done at the gym? Spray the Eir on your body. Available for purchase online at EiR NY+C. Cutting Board Tonic – I have several cutting boards that I use nearly every day when I cook. The tonic can be used on any wood surface to help clean and moisturize the wood. This will help maintain the woods natural beauty while making it safe to continue using it for food preparation. Available for purchase online. Enter Ecocentricmom in order notes to receive a free gift with order. Tonic No. 2 – Created by The Dandy Cat Apothecary it’s another multi purpose beauty item. You can use this as a facial cleanser, makeup remover, moisturizer, serum, mask or body treatment. I love finding products that I can use for more than one purpose. Available online at etsy. TigerNut Raw Snack – A Non GMO, Kosher, Vegan, Nut & Gluten free organic snack option. They have a variety of drinks, oils, baking supplies and snack options. Available for purchase online at Organic Gemini. Enter promo code EcoMomBlog at checkout to receive 20% off your order. I really enjoyed each of my boxes. Also with each product there was a discount code to purchase more! So if you really loved a product (like I love the Frontier Bites) you can order more at a discount. 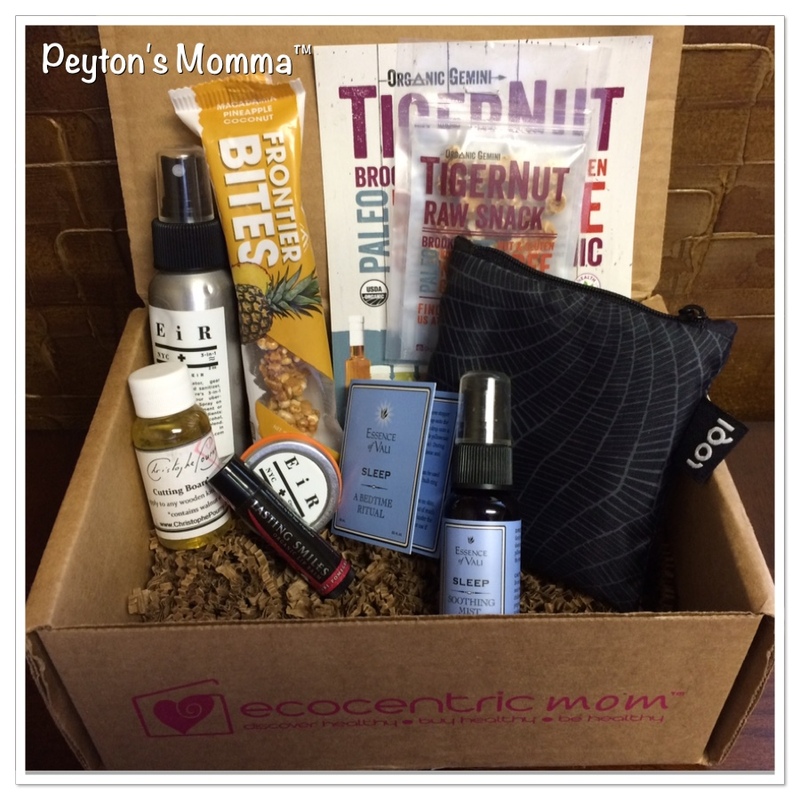 Ecocentric Mom boxes are perfect for gifting. And with Valentines Day just around the corner what a great gift for your wife, daughter or sister. You can order a gift or start a subscription online with Ecocentric Mom. Connect with Ecocentric Mom online thru Facebook, Twitter, Instagram or Pinterest.